When the Directors Guild of Slovenia was being established back in 2005 (10 years ago! ), we, its protagonists, mostly focused on a number of pressing or current problems. In such circumstances it was hard to believe that it was precisely us, the authors, who provided the decisive creative impetus for the audiovisual production. We ascribed this investment merely to our own creative eros or even ego, so we understood it as something self-evident. Therefore we only gradually truly understood that films do not only happen because of us, but that many other things occur apart from the films or because of them. Hard drives and other discs spin, programmes get filled, cable networks flourish, and, last but not least – profits get made. We had heard a few stories resembling fairy tales from our older colleagues about the copyrights of audiovisual authors. We had heard second-hand or third-hand accounts of how wonderfully this had been solved abroad. Meanwhile the money from audiovisual rights flowed without any actual influence or even supervision of the copyright holders. When the AIPA Association (Collecting Society of Authors, Performers and Film Producers of Audiovisual Works of Slovenia) was established after significant efforts it seemed that the goal was reached. Unfortunately it turned out that now the struggle for the appropriate regulation of copyrights only just began. Even though we know now what is right and what the rights are, we are in fact still at the beginning, starting with the outdated Copyright and Related Rights Act, which is, to boot, governed by rigid interpretations and seen from a strictly bureaucratic viewpoint. We are at the beginning because the collective organisations are still prisoners of interest groups, which are by no means interested in coordinated efforts. We are at the beginning because technological innovations keep resulting in new ways of distribution. We are at the beginning because piracy ideas are transplanted from populism to politics. More and more open questions remain without clear answers. Unfortunately it is illusory to expect that the state will register these problems correctly, let alone provide efficient solutions with modern and prudent legislation. Nothing good can come to pass without the active cooperation of film authors. However, it is not difficult to ascertain that none of the European countries have managed to establish absolute order and harmony in the field of copyrights. Even in well-regulated states nobody bestows these rights. They have to be won. As we meet colleagues from our neighbouring countries we can only smile at the similarities and kindred nature of the problems involved in the collective implementation of copyrights. Meanwhile, the solutions in the individual states are surprisingly dissimilar. At the same time it is becoming clearer and clearer that the field of copyrights will be regulated by the European directives; and, furthermore, that various cross-Atlantic agreements and contracts may be of key importance. Thus it is vital – now more than ever before – that we, Slovenian audiovisual authors, stand together and actively participate in the international associations like the Federation of European Film Directors. Only a unified voice of the international authors will be able to stand up to the corporate interests, which are, of course, very prominent in the national and European decision-making centres. The general assembly of the Federation of European Film Directors in Slovenia is an opportunity for strengthening our relations and consolidate our standpoints with the aim of ensuring a more efficient action, to find out first-hand how our European neighbours solve similar problems. We must know more – especially more than those who want to tell us that we are wrong. Delegates meeting at the General Assembly of the Federa on of European Film Directors (FERA), held in Ljubljana and Bled, Slovenia on June 12th through 14th, called on Members of the European Commission and Parliament to enact FERA’s five point action plan as part of the Digital Single Market initiative. Contractual terms that protect directors’ authorial rights throughout the value chain, allowing for fair contracts and fees. Restoring balance to the employment of freelance directors by allowing freelancers to organise and represent themselves collectively, bringing an end to unfair employment contracts. Fair remuneration for secondary use of our works. A funding environment that promotes sustainable incomes and careers for directors. Securing the range of voices and works across European film and television, with specific targets to end the under-representation of female directors. FERA’s newly elected Chair, British Director Dan Clifton, said: “Directors across Europe welcome the recognition by the Commission that fair remuneration of creators is crucial to growing the Digital Single Market.”As an example of why change is necessary, delegates were presented with the disturbing conclusions of a report by the Assembly’s hosts, the Slovenian Directors’ Guild, that some Slovenian Directors are working 16 hour days without additional remuneration, equivalent to a rate which is below the Slovenian minimum wage. FERA’s newly-elected Executive Committee now looks forward to collaborating with the Commission and European Parliament to bring forward firm legislative proposals to make fair remuneration a concrete reality for European film and television directors. The Assembly voiced its strong concern about the future of the European audiovisual landscape, where large multinational players are threatening cultural diversity and Europe’s fragile funding ecology with their corporate agenda to end state funding for film and television. Delegates also called for the implementation of targets across Europe to end the under- representation of female directors. Following successive reports highlighting inequality right across the Audiovisual industries, concerted action is long overdue. FERA endorses the strong action taken by countries like Sweden, where the Swedish Film Institute have insisted on funding parity between men and women, and calls for the policy to be rolled out right across Europe. All the guilds unanimously endorsed a statement which expresses their deepest concern over the report of their Austrian colleague about a new law proposal by their Ministry of Justice which would unjustly take away authors rights and its remuneration from directors, other authors and performing artists. Finally, the delegates saluted the outgoing chairman Håkan Bjerking, and members of the Executive Committee Dagmar Streicher and André F. Nebe for their commitment to FERA over the last years. They also warmly thanked their Slovenian hosts, who made the Assembly possible. 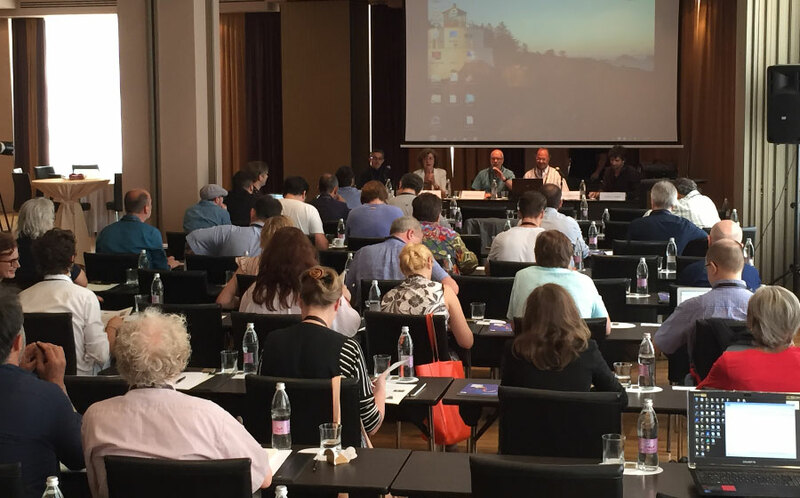 FERA’s 2015 General Assembly was hosted this year by DSR and AIPA, in partnership with the Slovenian Film Center.